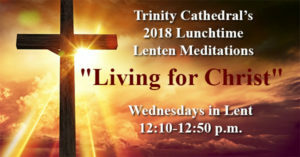 Join us at Trinity Cathedral Wednesdays at lunchtime (12:10 P.M.-12:50 P.M.) during this season of Lent. Our series will begin with singing psalms, hymns, and spiritual songs preparing our hearts and minds for a season of self-examination, prayer, and fasting. The four following weeks we examine the lives of four Christians who have gone before and consider what inspiration we might take from them for our own Christian lives.